In January 2015, Michael was awarded the Warwick University Staff Award for Outstanding Community Contribution. See here for more details. In Febrary 2016 Michael was appointed a Senior Fellow of the Higher Education Academy. Michael is President of Lytham Saints Anne's Classical Association branch, a co-Director of the Sidney Stringer School Classics Hub in Coventry, and a member of the Centre for Television History, Heritage and Memory Research, University of Warwick. He is also founder and director of the Warwick Classics Network, working with schools through Coventry and Warwickshire to facilitate the study of Classical Civilisation and Ancient History at GCSE and Alevel. His latest book, Ancient Worlds: An Epic History of East and West was published 1st July 2016 and in paperback in January 2017. In 2017 his TV documentaries, Italy's Invisible Cities (BBC1) and Sicily (BBC2) aired to a combined audience of over 5 million in the UK. In 2017-8, Michael was awarded a Leverhulme Research Fellowship for a project investigating the socio-political impacts of ancient global trade in luxury goods. You can watch a short video here, in which Michael discusses links between his research and teaching, bringing his work to a wider audience through outreach activities and what's special about Warwick. On the 1st June 2018, Michael was appointed as a Professor of Classics and Ancient History. Michael wrote a full page article for The I Newspaper in September 2018 on his and Warwick Classics' approach to teaching and communicating about the ancient world. Click here to read the article. My principal research interests lie in the intersection of ancient history and archaeology within the Mediterranean and more widely across the ancient world. Previous topics of study include the interrelationships between art and text, the changing perception and experience of sacred space, the political uses of architecture, the impact and use of epigraphic documents as both text and monument and the reception of the ancient world in the modern. My PhD, now published with Cambridge University Press, focused on the spatial development of monumental dedications at Delphi and Olympia. My book with Princeton University Press in 2014 brought the literary, epigraphic and archaeological evidence for the development, perception and role of Delphi from its inception through to the 21st century. My most recent book, Anicent Worlds, is a study of the growing connections between ancient civilisations from the Mediterranean to China. I continued this research during 2017-8 as a Leverhulme Research Fellow. For my current research interests, see my Research page. In 2013-4, I was awarded an IATL Pedagogic intervention grant for teaching in the Greek Culture and Society module, and an IATL Academic Fellowship for my Democracy and Imperialism in Classical Athens module. In 2014-5, I was awarded an IATL Pedagogic intervention grant for my Greek Religion module. In 2014-5, I have also been awarded an HRF Impact Award and an IAS Public Engagement Award for the organisation of the Department of Classics Ancient Drama Festival for Schools, at which over 560 school children will be enjoying a day of lectures and seminars surrounding a performance of Aristophanes' Thesmophoriazusae by the Warwick Undergraduate Classics Society. In 2015-6, I was awarded a IATL Pedagogic intervention grant for teaching in my Democracy and Imperialism module. In 2015 and 2016 I won Strategic and Departmental Impact grants to develop a new portal Oiko.world to facilitate the study of ancient civilisations and their connections, which will be incorporated into my new Undergraduate Ancient Global History module in 2018-9. In 2018 I was awarded an IATL Academic Fellowship to help develop my new Ancient Global History module - it is the first time that ancient global history has ever been offered as a module at undergraduate level in any UK university. 2017 University of Pennsylvania Press: Boeotia in the Fourth Century BC. Chapter entitled: ‘Boeotia and Delphi in the 4th century BC’. 'The Spatial Indeterminacy and social life of athletic facilities (other than stadia)', in P. Christesen and D. Kyle (eds. ), The Blackwell Companion to Ancient Sport and Spectacle (Malden, 2013). Space and Society in the Greek and Roman World (Cambridge, 2012). 'Displaying lists of what is (not) on display: the uses of inventories in Greek sanctuaries' in M. Haysom and J. Wallensten (eds. ), Current Approaches to Greek Religion (Athens, 2011) 239-52.
with L. Skinns and A. Cox (eds. ), Risk: the 25th Darwin Lecture Series (Cambridge, 2011). 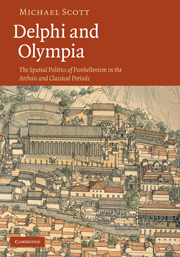 Delphi and Olympia: the spatial politics of panhellenism in the archaic and classical periods (Cambridge, 2010). From Democrats to Kings: the story of how the Greek world changed from Athens to Alexander the Great (London, 2009). 'Constructing identities in sacred interstate space: the case of the Arkadian monument at Delphi', BAR 1739 (2008) 431-8. 'Architectural sculpture in its archaeological context: the Siphnian treasury at Delphi', BABESCH 82 (2007) 23-33.